Since many people liked the space scene, I've decided to submit it, except without the girl, and a different tone. Water lily-stock from stock exchange. When I logged in this was the first thing that caught my eye. Oh i like this even better without the girl. I just love how pretty this is. i will add this to my favs. 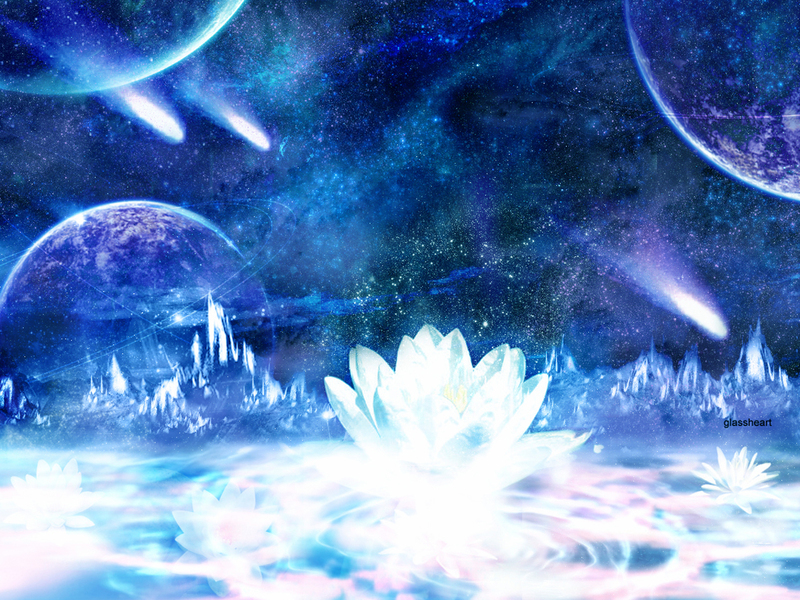 i likey the crystally spacey look and the nice cool effects of the bg! I love the whole atomsphere scene. Nicely done effects and stars surrounding. love the space. Looks so beautiful. love the blueness of it. me really really like it!!! Finally I am able t download which is nice. Thumbs just does not do justice to enjoy this picture. I liked your earlier wall with Kirika but changing the character to a flower also give it a nice feel to the background. Good work and thanks much. its georgous glassheart! *stares in awe* Lily is the name of my twin sister! lol. the wall here is stunning and beautiful! the scene here is great and i love how it glitters~ O.o well, adding to my faves now! so pretty! *applauses* well done! *applauses again* i love this wallie, its so beautiful!!!! Hey, it's the bg from my present XP . It still looks awesome :) ^uu^ *starry-eyed*. The water lily add another bit of beautiful and complexity to the wall, would have been nice to see it used with the in some sort of way. But, it makes due being a normal wallpaper, wonderful work Glassy :D.
the flower`s really really nice! it's gorgeous. the space scene and the lily are beautiful. the wall looks really stunning.